Alweld 1242. Jon Boat is 12 feet long and 42'' wide with a 16'' transom. This boat is flat bottom and can be powered with an electric or gas outboard up to 15 horsepower. This is a cash and carry price for the boat only. We can supply the motor or trailer if needed. History- Alweld, a Lonsdale AR company is a privately owned 30 plus year old company, that builds over a 1000 boats a year. 1)	Computer Aided Design (CAD) . 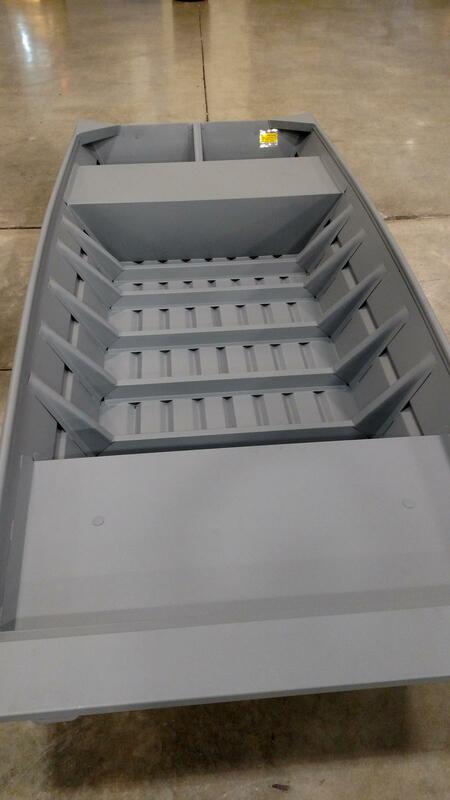 All Alweld boats are CAD designed to insure optimal accuracy, consistency, repeatability in construction technique. 2)	Computer Numerical Control (CNC). All Alweld boats are CNC plasma cut to insure optimal integration with CAD designs to produce accurate, consistent, repeatable hulls and decks. 3)	Computerized Presses (CP). Alweld uses programmable presses that give our boats straighter and stronger hulls. 4)	More keels per boat. Keels ( bends in the metal ) add toughness and rigidity to the hulls and sides of the boats. Alweld uses more per square foot than the competition. This adds tremendous to strength to the boat. 5)	Tungsten Inert Gas Welding (TIG) All Alweld have a center keel welded, no use of extruded aluminum pieces to join the hulls together. TIG welding creates a narrow affected zone elimating the possibility of stress cracks and distortion giving the boat a leak proof stronger hull. Also corner plates are TIG welded showing more consistent welds. 6)	Mega Ribs. Ribs are what give the hull strength and Alweld uses more per square foot and heavier duty ribs to give the boat a lifetime of reliability. And our V-bottom ribs are solid not pieced together.